Sherry A. Rogers, M.D. 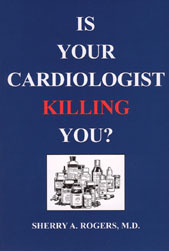 - Is Your Cardiologist Killing You? by Sherry A. Rogers, M.D. Home / Books / By Author / Sherry A. Rogers, M.D. / Is Your Cardiologist Killing You? by Sherry A. Rogers, M.D. Enlarge Image Email to a Friend Is Your Cardiologist Killing You? by Sherry A. Rogers, M.D. Product Description: Medicine has had a free ride by drugging every symptom for long enough. The evidence is clear that drugs merely work by poisoning a pathway that makes the symptoms subside. However, in doing so you have missed a golden opportunity to actually cure the problem. So eventually the problem worsens and requires more medications. As well, all drugs use up or deplete nutrients from the body in the work of detoxifying them. So by a second mechanism drugs also create new symptoms and diseases that seem unrelated and are often unsuspected as being caused by medications. The exciting part is that we now know so much molecular biochemistry of the body, and how it is orchestrated to harmonize with foods and nutrients that we have enormous power to actually cure conditions that are currently relegated only to drug therapies. This book focuses on cardiology problems from high blood pressure, cholesterol, arrhythmias, and congestive heart failure to what to do after a heart attack, stents, bypass, or to reverse coronary calcifications. It contrasts the current practice guidelines and pharmaceutical focus, as well as cardioversion and ablation, with the overwhelming evidence on how to actually cure much of this and not need drugs at all. Furthermore, it details the serious and often life-threatening drawbacks of the pharmaceutical approach. Last but not least, it instructs you how to quiz your perspective cardiologist to determine if he is from the old school where every symptom is a drug deficiency, or from the approach that looks for the causes and cure of your life robbing heart disease. About the Author: Sherry A. Rogers, M.D., board certified by the American Board of Family Practice, is board certified by the American Board of Environmental Medicine, a Fellow of the American College of Allergy, Asthma and Immunology and a Fellow of the American College of Nutrition. She has been in solo private practice in environmental medicine for over 39 years in Syracuse, NY where she sees patients from all over the world. She has lectured at Oxford and in 6 countries where she has taught well over 100 physician courses, has published over fifteen books including the landmark books Detoxify or Die and The Cholesterol Hoax (www.prestigepublishing.com), over 20 scientific papers, textbook chapters, was environmental medicine editor for Internal Medicine World Report, received the American Academy of Environmental Medicine's Dr. Herbert Rinkel Teaching Award for Teaching Excellence, has a referenced monthly newsletter for 20 years, a non-patient consulting service, a lay and professional lecture service, is the guest on over 100 radio shows a year, and more. Macro Mellow by Sherry Rogers, M.D.